I thank God for carrying me through the first three weeks of working as a Geriatric Nurse Practitioner at the 500-bed nursing home. The insurance company assigned me to provide medical care for 32 residents who have enrolled in their program as an alternative to Medicare. Judy has worked for the company for awhile and is my excellent preceptor. After she orients me, they will move her to another facility in the state. I need to do a complete physical examination on each of my patients, type it into the insurance computer in their format, and then call the family member to introduce myself. I only have nine more physicals to finish by the end of the month. In May, I will do a shorter assessment on each patient and call the family with a quick update. If the patient has a new problem, the nursing staff calls me to assess the resident that day and treat the problem as quickly as possible. So far, the only downside is that there is no air conditioning because the home was built in 1935. I feel sorry for the patients in the heat, especially on the top floors which are the hottest. My office doesn’t have any windows or air conditioning, so the medical director said I could do my charting in the doctor’s night shift room which is empty during the day and has a window air conditioner. I have enjoyed working with Dr. R. who is a board-certified geriatrician and likes to teach me about geriatrics. My biggest adjustment is assessing the patients with advanced dementia (memory loss) who are unable to communicate their needs. I have to depend on the nurse’s assessment and input from family in addition to my physical assessment. The staff is wonderful in giving the residents activities to stimulate their memory. Dear Lord, Thank You that this cold is a very little thing in light of eternity. Help me keep the big picture. If You want me to work today, put Your healing hand upon me. If not, I rest in You and trust in You. Thank You that You do all things well. Amen. God has so graciously been carrying me along at work and things are going more smoothly. I finished all 13 of the new patient’s physical examinations and 52 monthly visits plus all the sick visits for the month of May. I have now completed eight weeks of work at the nursing home. My biggest concern right now is my vision which has become more blurry from all the long hours of charting on the computer. I saw an optometrist and she could not correct my left eye beyond 20/60 and said my left optic nerve doesn’t look right. I thank God that I don’t have a retinal detachment. My uncle went blind when he was about my age from retinal detachments. After three hours of very uncomfortable eye tests with bright lights, the ophthalmologist said he couldn’t find any retinal or macular tears. He is referring me to a retinal specialist who can’t see me until August. Trudy, my dear friend who has battled glaucoma for many years, said that her eyes are in God’s hands. If she loses her sight, God will be her vision. Two weeks ago a Nurse Practitioner (NP) at the insurance company resigned, so they assigned me to cover his patients in another nursing home as well as my own. So now I am responsible for 96 patients. When I interviewed for the position, they assured me that I would only have 70-80 patients. My new supervisor said this is their goal, but I’m the only one who is credentialed at the hospital which owns the second nursing home. I am so exhausted that I feel like I’m at the breaking point. Mary, a NP at the main nursing home, told me there is a 32-hour position open that is not associated with the insurance company, and they want to recruit me for it! She also said the nursing home is losing money with the insurance company and will probably soon terminate their relationship. I like the administration at the nursing home but have not had much support from the supervisors at the insurance company. After Dr. S. interviewed me, he offered me the position of 32 hours weekly with every Friday off and full-time benefits. He said they would bring me in at the top of the pay scale for Nurse Practitioners. This is such a gift from God! Dear Lord, Thank You once again for Your wonderful deliverance and that You won’t test me above what I can bear.” Amen. God carried me through some grueling eye tests from the retinal specialist doctor. He strapped my head in a machine, put a magnifying glass straight on my eyeball, and then told me to look at a very bright light without moving. The tears were streaming down my face because it was so uncomfortable. Then I started silently thanking Jesus that He is the light of the world. I remembered the verse above and the wonderful hymn “Leaning on the Everlasting Arms”. The doctor said part of my vitreous (like jelly in my eye) is covering the retina like wrinkled plastic wrap. There is nothing he can do about it, so we’ll just “watch it”. My new glasses arrived this week and I am seeing so much better. Thank You, dear Lord, for my vision today! I told Bee, one of my coworkers, that I know the Lord Jesus Christ will be my eyes if I go blind. She came up to me a few days later and said, “I wish I had your faith. I feel so guilty about not teaching my adopted son anything about religion.” I shared with her the good news about Jesus Christ and how much He loved her that He died on the cross for all our sins and rose again. He wants her to receive Him as her personal Savior. I also gave her some literature and a children’s Bible study for her son. 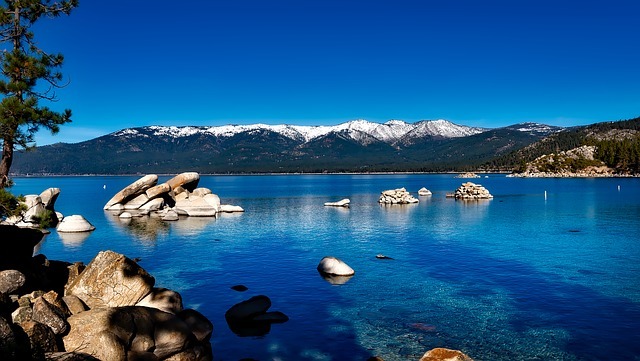 I thank the Lord for a refreshing vacation with two ladies from church at beautiful Lake Tahoe in California. What stunning mountain scenery! We even caught some fish in the sparkling deep lake. The nursing home becomes my new employer tomorrow. The Lord gave me a refreshing vacation at Lake Tahoe. I enjoyed my next five years of working in geriatrics at the nursing home. Every day was a new experience and challenge as I progressed in my knowledge of assessing and treating older adults. I also learned that I needed to communicate clearly with the family members since the resident often couldn’t remember the information I gave them. Even though I didn’t stay with the insurance company very long, God used that to get me in the door at the nursing home and guided me to a much more manageable job with less stress.